Work with experts when fabricating large custom clocks, ranging from 3’ to 50’ in diameter, for towers and walls! Highlight any location with backlit LED and GPS-controlled canister clocks (drum clocks)! Automate your existing cast bell or add the sound of real cast bells to any tower anywhere! 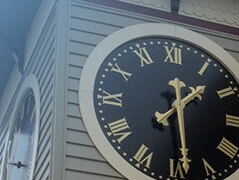 Turn your building into a landmark with three and four-sided bracket clocks! Spruce up your landscaping with our large custom garden clocks featuring hands that can be planted or lit! Bring your historic and monumental clocks back to their former glory with our restoration, retrofitting, and repair services! From fabrication to installation, Americlock specializes in the design and manufacturing of bells and large custom clocks for towers and walls. We also provide international delivery and installation services and our work can be seen around the globe! Our team of experts can manufacture timepieces for projects of any size, including over-sized clock towers and large church clocks. We also offer completely original bespoke custom clocks as well as pre-designed traditional or modern dial designs, hands, and markers. Fast production turnarounds backed by fully insured installation, maintenance, and repair options available around the world. Two digital bell systems to choose from, offering the perfectly replicated sound of 32 and 64 bell-chiming and tune libraries. It’s easy to design your dial face right now! Select from traditional and modern hand/marker styles on different backgrounds. Inherent to the New England landscape and other areas throughout the United States, steeple and church clocks are historic American treasures that require special care and maintenance. 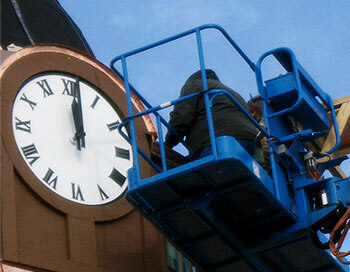 Fortunately, we’re experts in church clock repair and renovation. Americlock is a leading large custom clock manufacturer and our background in historical clock restoration and repair gives you the best of the past, present, and future. 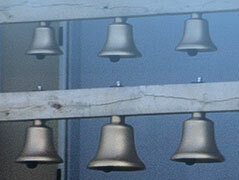 We can even refurbish bells or automate bell ringing for cast bells and entire carillons. 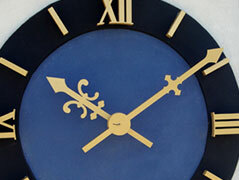 Our tower and wall clocks can be implemented for indoor and outdoor applications. Exterior wall clocks can be built and installed for interior use as seen in retail shopping outlets, malls, food courts, universities, and corporate campuses where dials serve both functional and aesthetic purposes. We also can create custom solar-powered clocks in addition to our cellular phone tower clocks (providing resistance to disruptive frequencies). Americlock’s specialties also include custom botanical clocks (great for floral gardens or roundabouts where even the hands can contain planters), canister clocks, and cupola clocks. These custom designs create centerpieces for large public areas and, beyond providing an innovative way to present time, they become focal points that form lasting impressions. Click here to see a list of all our different services and project photos.